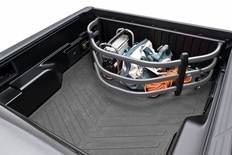 Whether you use your truck for work or play, there are many accessories for your truck bed that will make it that much more functional. We offer various Bed Liners, Bed Steps, Bed Extenders, Truck Bed ToolBoxes, Tailgate Locks, Cargo Slides and Drawers, and so much more. Start shopping below. We'll help you haul it, lock it, protect it, access it, and make your truck look great in the process!